This 5 bedroom 4.5 bathroom home built in Dayton, Ohio showed some minor water staining on an interior window. Surely being that they had a professional home inspection recently before their purchase of this home the damage must be minor. The home owners called us to inspect the damage. 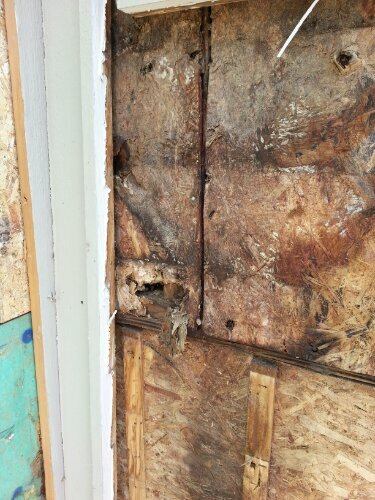 Upon a closer inspection I noticed evidence of water damaging the siding from the inside out. After removing a few boards by hand the issue was apparent. 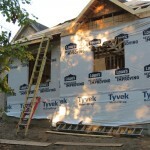 No Tyvek or flashing anywhere. The builder relyed on osb lap siding with no back up plan to protect the home owners largest personal investment. •Replace most of the Pella windows. •Repair and replace critical framing members. •Re-sheet large portions of the home. •Install a proper rain screen. • Properly installed Hardie Siding. The issue of water piercing your homes envelope has been approached with modern building techniques in the last decade. 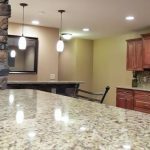 Much the same idea as modern showers new methods concede that water will indeed, as proven through centuries of wood home construction, infiltrate your homes siding. 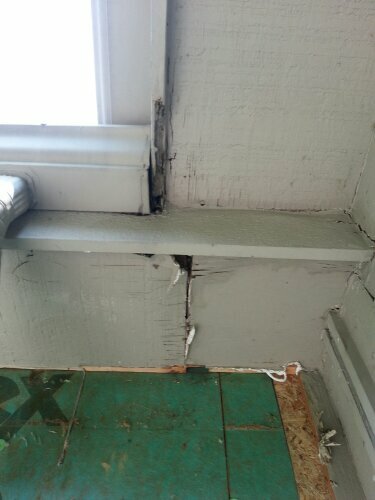 The new idea is to ofcourse prevent this as much as possible but also to manage this water directing it behind the siding, around the windows/doors, and out away from your homes foudantion prevent any structural damage and ensuring a siding installation that will last decades beyond its predecessors. 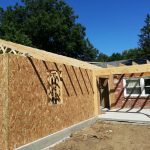 As the job progresses we will update this post, and outline both the effects of poor building, how this could have been prevented for less than .1% off the homes value, and our solution for this family.